One of the greatest debates in cooking could arguably be the age-old dispute of which type of wok is best to use. There are many options – cast iron, carbon steel, stainless steel, aluminum or the latest, electric. While some swear by cast iron woks, others are die-hard carbon steel users. Long handles versus loop handles, pre-seasoned or not; it gets about as deep as the rivalry between Android and Apple users. Choosing the best wok can be a challenge. It depends on things like the style of cooking, the type of stove being used – even the chef’s arm and wrist strength. At the end of the day, the best wok is really the one that you are most comfortable in using. And so after an extensive test-study, we’ve ranked the top 10 best woks so you can make the right purchasing decision. As they say, it all boils down, pun intentional, to the wok. Choosing the top 10 woks from literally dozens of models is no easy feat. To whittle down the selection, we took a look at several factors: quality, durability, features, pricing, care instructions, versatility, output and customer feedback. Points were awards for each category, and the top ten woks moved into the next round. This is when testing was performed to determine the best of the best. A majority vote by a panel of expert judges helped determined the final ranking. Each wok has undergone the test of preparing a basic stir-fry meal, using the exact same ingredients, oils and seasonings. Heating and cooking techniques were used according to each wok’s capability. Meaning, an electric wok obviously can not be tested on a gas stove or grill, so in most cases we used gas or propane stoves. We would have tested woks that are capable of use on other heating sources (i.e. coal, open fire, electric, etc.) under those conditions in order to get the full range, but we wanted to be fair and were under time constraints. The Good: Coming in tenth place is the crowd favorite on Amazon.com, the electric wok by Aroma Housewares. Sitting at the more inexpensive end of the scale, this is the perfect starter wok for the apprentice chef, who is new to the high-temperature cooking experience. It is safe, convenient, easy to clean and capable of holding 7 quarts of food; enough to feed the entire family. With full range temperature control, this plug-in electrical unit heats up just as well as the big boy, non-electrical woks. Turn the dial, and simmer at a lower-degree temperature, or put all of your 1500 watts to use, by turning up heat. As hot as it got, we were surprised to discover that this wok has a “cool touch” feature that keeps the outside of the unit from overheating. The food may not have had the sought-after “wok hei” we love so much, but it was quite tasty and worthy of making this list. The Bad: Although the AEW-305 Electric Wok has garnered plenty of online sales success, there are some setbacks to the design of this unit that could not be ignored. The most glaring is the temperature control feature. Instead of degree temperature settings, the unit has a “2, 4, 6” temperature settings which can only be interpreted as low, medium and high. Also, we would have liked to get a glimpse of the food as it was cooking, but the black, non-stick lid prevented us from doing so. Our test didn’t allow for us to verify this for ourselves, however customer feedback and common knowledge confirms that the non-stick coating can and will peel when it comes in contact with certain liquids after heating, as with the use of metallic utensils. The Good: On the journey to achieving wok hei, cast iron woks are likely to get there in less time. Cast iron woks have proven to be among the superiors in flavor retention and performance, yet only two have made appearances in this list. What sets the P14W3 apart from the rest? Simple. Not only does it have the backing of the largest e-commerce in the world, but it comes pre-seasoned, too. This universal wok is capable of substituting itself for any pot, pan or skillet in your kitchen, and can be the only cooking tool you’ll need outdoors. The food came out great, giving us the authenticated taste of stir-fry that we have come to expect. The Bad: It is rare to find a cast iron wok that comes with a lid or accessories, but it’s still a possibility—just not in this case. To add, we had to be careful not to get distracted because it takes a while to heat up, and to cool down. It holds a lot of heat so you run the risk of burning food, if it is not removed promptly when it’s done. Also, the pricing seems a little higher than comparable cast iron woks and though it may be worth it, it counts as a strike. Pro Tip #1: Season your wok with either peanut, flax seed, canola, vegetable or coconut oil only. Never use olive or sesame oil. Before applying, make susre the wok is warm, or at very least completely dry. The Good: At first glance, you won’t know whether to cook with it, slide down a snow hill or report it as a UFO. This massive 30-inch wok is not just for the professional, it’s for the novice who comes close enough and has a great deal of mouths to feed. 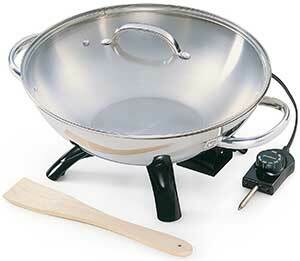 It is truly an authentic, Cantonese style wok, handmade with forged steel. It weighs in at 20.2 pounds, and is as deep as a kiddie pool with its 9-inch depth. Its riveted loop handles are built to be long-lasting, to withstand the heaviest of food orders. If you’d rather “go home,” than “go big,” fret not. 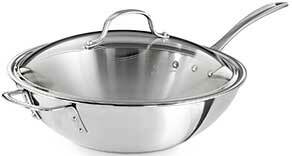 This wok comes in a wide range of sizes, varying in price. Although this unit is large enough to feed a small army, we only prepared a small portion—enough to feed myself and all of the judges. However, it took myself and a couple of judges to maneuver this wok when staging our cooking area. The food came out excellent; it was the closest we came to producing restaurant quality stir-fry, hands down. The Bad: With the unit’s weight, we immediately gave up on tossing the food by the handles and used another unit’s utensils in order to ladle and stir. Granted, Town Food Services is looking to feed an entire town with this sized wok, so it is sold as a single piece. So, unless you intend to cook regularly for large groups of people, or to start your own restaurant, a wok the 30-inch might be impractical for a typical household. We recommend ordering one of their smaller sizes. Did You Know? Woks can vary in diameter size, ranging from 8 inches for a small or single-serving, to as large as 36 inches for large groups or commercial use at a restaurant or food factory. The Good: This shiny, plug-in version of a wok could not be counted out. This easy-to-use, easy-to-clean dishwasher-safe, 14-inch unit can reach temperatures as high as 400-degrees. Surprisingly, it heated up fairly quickly, too! You can monitor cooking activity through its tempered glass lid, that is accented with a stainless steel rim and handle. For added convenience, a long wooden spatula is included with purchase. It is very attractive and can be complimentary to any stainless steel kitchen. Perfect for the aspiring wok chef! The Bad: When setting up our cooking station, we found the 30-inch cord to be a little too short and slightly inconvenient. You many need to plug it into an extension cord. As effective and charming as it is, we feel the price point for the Presto 5900 is set a little too high. The Good: This modern, rustic cast iron wok comes pre-seasoned and up to the task of cooking in or out of the kitchen. Perfect for outdoor dining and camping, whip up your favorite recipe and let the wind carry the aroma from tent to tent. Capable of preparing food using any heating source, its classic look, flat bottom and extra-wide loop handles makes it that much easier to carry it from the heat source, directly to the dining table; where it doubles as both an entree, and a delectable centerpiece. During the test, we shared a revelation while we were eating, not only did the food seem more colorful, and the flavors more prevalent, somehow it felt more like a family dinner. We’ve chalked it up to the extra-long handles, that encouraged us to serve from wok, on the dining table. The Bad: As indestructible as it may seem, Useful’s 14-inch cast iron beauty is far from it. Avoid taking it directly from the heat source to cold water, as it is non-resistant to thermal shock. Once it has cooled, which may take some time, then you’re ready to clean it. It has to be cleaned by hand, without any soap or detergent. It must be towel dried, and then warmed up before applying oil and storing it. The maintenance for this wok is not so far off from most others, however this delicate cleaning process counts as a strike against it. Pro Tip #2: When seasoning your wok in the oven, remove the wooden handles if possible, or cover your handles with a wet towel, then wrap them with aluminum foil. We do not recommend that you use the oven to season your wok if your wok has plastic handles. The Good: We are well aware of the stainless steel kitchen disciples out there, and yes we are looking out for you, too. No stainless steel kitchen is complete until the cookware matches the appliances, and now that you are ready to add a stainless steel wok to your collection, take a look at our selection that made the top 5. Calphalon’s sparkly Tri-ply Stainless Steel 12-inch Wok comes with a tempered glass, high dome lid, allowing you to keep a close-watch on your meal as it cooks. Safely stir your soups with any utensil—plastic, wooden or metallic. Use the long, stay cool handle to show off your tossing technique for family and friends. Not only can you cook confidently, but you can buy with confidence as well, with a manufacturer’s lifetime guarantee. Well worth the price tag. Did I mention it is also oven and dishwasher safe? The Bad: Its pluses far outweigh its minuses but still, they must all be addressed. Its 12-inch diameter makes it the smallest of all woks on the list. The stainless steel finish makes it a little heavy, and slow to heat up. Unfortunately, this wok comes with no accessories and lacks authenticity in the flavors. Did You Know? High quality woks are machine-hammered, or made of spun steel and are 14-gauge or thicker. 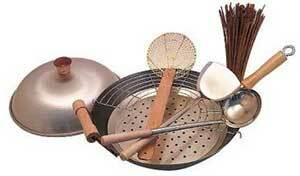 However, the best quality woks are handmade, hand-hammered from at least two sheets of carbon steel. The Good: Available in 12 and 14 inches, the TW008 is by far the best wok for the asking price. Made in Taiwan, this flat bottom wok has gorgeous Birchwood long and helper handles. The long handle is equipped with a convenient hook ring for hanging, space-saving storage. It also comes in the large, Birchwood loop handles style as well. The Bad: The eye-catching handles serve as both a blessing and a curse, causing the carbon steel wok to be safe for use on gas and electric cooktops only. Since it is a flat bottom wok, that requires seasoning before initial use, under the circumstances, we found it slightly inconvenient that we could not season it in the oven. We had to hand-tilt and turn the wok in order to season the sides of it. The Good: Holding the third spot is the best wok set available online to date. The Wok Shop is definitely on to something—easily filling in two of the top 3 slots on our best picks list. If the intention is to give their buyers the all-in-one shopping experience, then mission accomplished. At an unbeatable price, you get a 14″ carbon, spun steel wok, with a long wooden handle and helper handle, a wok ring, cover lid, ladle, whisk, spatula, strainer and steamer racks. It’s hard to resist high-quality products, for a bargain price which is largely why the wok set sits high above the competition. We admit, having an all-in-one, authentic wok experience was refreshing. We had everything we needed from start, to finish. Although the food was very delicious, we know that over time the food will taste even better with more seasoning. The Bad: The strainer and cleaning brush are not quite low-quality, but we feel they may not withstand constant use and are more appropriate for those who don’t intend to use the wok regularly. Otherwise, you may want to invest in the Wok Shop’s more sturdier cooking utensils. Pro Tip #3: Most woks do not require soaps or detergents for cleaning. Immediately after use, use warm or hot water and a bamboo cleaning brush to effortlessly scrub away any food residue, then place the wok back onto the heat to dry it thoroughly. The heat also burns away any bacteria that may be lurking. Carefully apply oil to season the warm wok, then store it in a dry place. The Good: This masterfully hand-crafted, round bottom wok is a high-quality specimen that is unmatched. Pummeled into shape by hand, its distinctive “dimpled” design gives it character, and is an ever-present reminder of its genuine authenticity. The carbon steel loop handles aid its versatility, allowing for use on the grill, on coals, in ovens and stovetop. 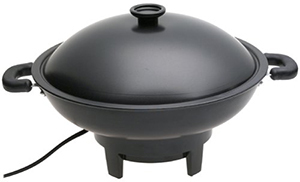 It comes in sizes ranging from 10 to 24 inches in diameter, and includes a wok ring. For a modest asking price, you can get the best quality wok, in a classic design that will pay off big in the long-run. That’s right, care for it properly and you too, can achieve “wok hei” – the food cooked beautifully, and tasted great! The Bad: You don’t miss the utensils, because of the long handle and round bottom, however it would have been nice if this wok came with cooking utensils. The Good: Hand-hammered by professionals in Guangzhou, no wonder this wok is popular with Chinese chefs. Unquestionable quality at its finest, this wok prefers to catch flames by gas or open fire, with the sole purpose of delivering rich, wok hei flavors. The seller of this unit indicates that the handles could be removed for oven use, but who would want to tamper with such craftsmanship? Not I. It is deceivingly lightweight; appearing much heavier than it’s 4.63 pounds. We discovered that the food collecting in the round bottom, cooks and marinates simultaneously, which is why this wok’s performance unanimously positions it in the number one slot. The Bad: This wok does not include accessories, but requires a wok ring for flat surface cooktops. Because of the beautiful hand-crafted quality of the long wooden handle, unfortunately is not safe for oven use. We had to use another wok’s utensils for cooking. Pro Tip#5: Having difficulty seasoning a round bottom wok? Try removing the wok ring, and placing in face down in the oven or over the heat source. Is that better? You’re welcome. If saving money plays a big part in your decision, then #3 The Wok Shop Carbon Steel Wok Set, is your best bet. It comes with everything but the ingredients. It even has the round bottom that we’re sure has the advantage when it comes to that getting that savory, wok hei flavor that non-traditional stainless steel or non-stick cookware (i.e. #10 Aroma Housewares AEW 305 Electric Wok or #7 Presto 5900 1500 Watt Stainless Steel Wok) may never attain. When the craving for tantalizing Asian-style cuisine hits and you want to satisfy your appetite, there is at least one restaurant that pops into mind, right? It could be the popular Chinese restaurant across town that you would be willing to go through hell and high water to get to, or maybe it’s the inviting warmth of the small, family-run Thai location that, without reservations, you may need to camp-out in front of the night before just to be seated. I myself, tend to crave the ever-so-scrumptious Mexican-style cuisine, that also employs the wok (or “disco” in this case) as the primary cooking tool to make dishes like discada and other northwestern grilling greats. Whatever tempts your taste buds, there is a very good reason we are so willing to go to great lengths for such delicious food—a simple explanation of why we always prefer the flavors of a one location over another. It is because of something commonly referred to “wok hei,” the breath or essence of a wok. The wok is a universal cooking vessel, that could be used to fry, boil, braise, poach, sear, smoke, stew and roast. 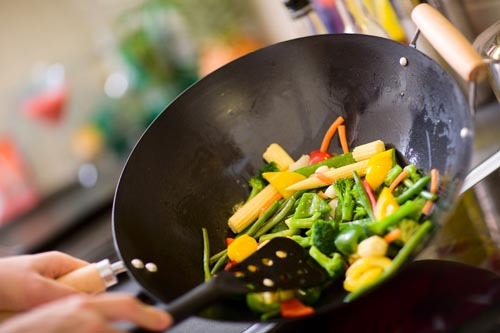 If seasoned and properly maintained, a wok can be a long-lasting, resourceful tool that can help you become the flavor master of Asian or Mexican-style cuisine in your very own kitchen. Instead of taking on hell and high water, or camping out overnight to eat at restaurant, why not become the chef whose food you crave? But first, you must select your wok. Everything surrounding the wok experience is simplistic, quick and easy. Its name, its functionality. 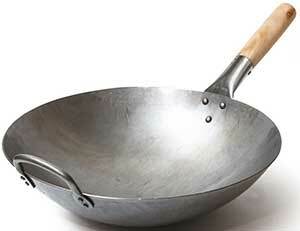 So when you see or hear reference to “round bottom” and “flat bottom” woks, they are exactly as they are called. A flat bottom wok can be placed on flat surfaces for cooking, while a round bottom wok can not safely stand on its own, and requires what is called a “wok ring,” to steady it in place. A round bottom wok is perfect for executing the chef’s toss—a quick flip-of-the-wrist action to bounce the food ingredients off the wok’s walls, as opposed to stirring. Woks can be finished in either carbon steel, cast iron or aluminum and are designed to cook food quickly, under extremely high temperatures. Not all woks can withstand the wear-and-tear throughout the test of time, and they all require proper maintenance and storage. If not properly cared for, some woks can misshape or deform—some can even shatter! For some, the “non-stick” feature is of great importance because they would much rather have an easy clean-up job after slaving away in the kitchen. While others, who don’t mind a little food sticking every once in a while, are willing to put in time to scrub, if it means not compromising wok hei; a distinct flavor that can only develop over time. Let’s not forget those who cherish the kitchen aesthetics—the sometimes hard-core, exclusive buyers of stainless steel, who work hard to keep their kitchen’s appearance in shimmering uniform. Needless to say, no matter who the chef is, all finishes can ultimately get the job done. However, we know that you have a choice when selecting what’s best, no matter what your buying situation is. The following table will serve as your buyer’s guide to inform you of the benefits and fall-backs to cookware finishes. Woks come with two handle types: stick and loop. A stick handle is a long, single handle that can either be an extension of the wok’s finish, or it can be wooden or plastic. Loop handles, are exactly that, and are mounted on opposite sides for secure handling. Exercise extreme caution when using a wok, as temperatures are typically above 400-degrees. The element of danger is always present when working with any heating source. Having a bucket of water or a small multi-purpose fire extinguisher handy, wouldn’t be such a bad idea. Whatever have you, please be alert, be careful and be safe. Pro Tips #6: For pesky stains, or you would like to restore an old wok, we recommend using Easy-Off oven cleaner and/or “Barkeeper’s Friend.” Use only as instructed. Be sure to wear gloves, and properly ventilate your kitchen or cleaning space. If using a basic kitchen scrubber, be sure to discard it when you are done. So, you’ve selected your wok, torn open the packaging and now it’s time to get down to business: the initial use. Most woks require what is called, “seasoning” before they can be used. Seasoning is the tempering process of treating your wok with cooking oil and exposing it to high heat (475 degrees or higher). This procedure allows your wok to lock in flavor, and eliminate any impurities that may affect the taste of food. Be advised that seasoning is an ongoing process, that is directly responsible for wok hei. (Note: never use olive or sesame oil for seasoning your wok). Some woks can be purchased “pre-seasoned” which means you can start cooking on it right away. If the wok you’ve purchased isn’t already pre-seasoned, then it’s up to you to get it started—and that’s a good thing. What better way to personalize your wok, than by seasoning it yourself? You can truly make it your own. You will need to season your wok before and after use or cleaning, and/or according to manufacturer’s specifications. It may sound like a lot of work, but it isn’t. Think of it as a long-term relationship that you are nurturing, and the best parts: not only does this relationship comes with instructions, it gets better over time! Thumbs up. After having a belly filled to capacity with fresh stir-fry, there are two things I am most certain of. One being, that this list will rival any list you can find online. Two, it will be a long, long while before I “wok” into a restaurant and order stir-fry. That’s for sure. All jokes aside, compiling this list has turned out to be an absolutely unforgettable experience. There were highlights and lowlights, obstacles and triumphs, but none greater than the pride I feel for my team, for having put in the time, money, energy and effort it took to bring you our very best picks. When all seems lost, count on us to narrow-down your endless options, and assist you with making an informed decision before you make a purchase. Please use our tips and findings wisely—and don’t just get one for yourself, consider a wok as a gift for a loved one. After all, we are in the midst of the season of giving. It’s a good time to be “wok-ing” in the winter holiday season. Um, scratch that—an obvious side-effect of my stir-fry food coma. Be sure to leave a comment below informing us of your purchase selection, along with your own personal wok experience.